Welcome to The West Texas Paradise! Deep in the rolling plains of West Texas is a place where memories are made. That place is Ranger Creek Ranch. The Main Lodge at Ranger Creek Ranch is located approximately 17 miles west of Seymour, Texas just west of the tiny community of Vera, Texas. We are approximately 160 miles west of Fort Worth, Texas on highway 114/82. Please download driving directions to the Main Lodge and the various Ranch house guest properties. The historic ranch is a place where people come to get away from their fast paced lives and settle down for a few days of relaxation, incredible meals and thrilling activities. Here at Ranger Creek Ranch, we offer all of the modern day lodging amenities while keeping the rustic and nostalgic feel of ranch life. 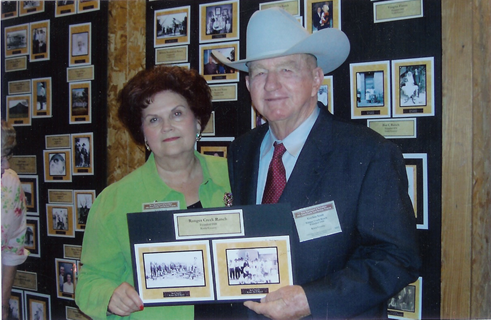 In order to extend the farming and ranching operation and as a means to introduce the public to this exquisite region of the state of Texas, Ranger Creek Ranch was founded in 1990 by Joyce and Gaylon Scott and their daughter Ranell Scott. Ranger Creek Ranch’s roots are as deep as the mesquite trees that grow upon it. Parts of the ranch have been in the family since 1900. In the beginning, the ranch was made available for private and corporate hunting leases and day Hunts, as well as private parties and corporate retreats. The operation ran from the office and often the kitchen table in the old ranch house. In 1998, as a result of increasing demand, the family decided to renovate and rebuild a rustic old barn in grand Texas style. The resulting structure is now a fine example of grand Texas hunting style and purpose. Ranger Creek Ranch is happy to share this fine lodge and the surrounding land with discriminating guests from all parts of the world. Ranger Creek Ranch is one of the most diversified ranches in Texas for Texas Hunts & Adventures. Almost any outdoor activity is possible within the borders of the ranch. Today and going forward, Ranger Creek Ranch offers some of the best Waterfowl Hunting and Dove Hunting in the United States. Further, the canyons, cedar breaks, and mesquite flats offer Wild Hog Hunting, Whitetail Deer Hunting and free range Aoudad Sheep. Even Further, Ranger Creek Ranch offers some of the best outdoor adventures in the nation. Ranger Creek Ranchoffers walking and riding trails through endless miles of scenic canyons, beautiful spring fed creeks, and acres of grass land. On these trails, our guests have the opportunity to see exquisite and elusive wildlife, incredible landscapes, beautiful foliage, and breath taking star filled nights. This combination affords Ranger Creek Ranch guests unparalleled Big Game Hunting and Big Adventures in Texas.Ranger Creek Ranch is truly a photographers dream. Our family invites you to join us. Come out, hunt, break a sweat and cool off in a spring fed pond, relax on the balcony watch the sun go down, breathe the fresh air and settle in to a slower paced life. Gaylon and Joyce Scott accepting the Family Land Heritage Award in Austin, Texas. Gaylon’s ancestors settled the land that is now known as “Ranger Creek Ranch” December 10, 1900, and has been in the same family for over 100 years. © Copyright 2018 Ranger Creek Ranch. All rights reserved.